Lamb Rogan josh is an Indian curry and it can be distinguished by its very thick, flavourful red sauce and tender lamb meat. The word "Rogan" meaning, clear butter or oil in Persian and is known as "red" in Hindi. The word "Josh" refers to strong or passion (fiery or hot) therefore the dish is prepared or cooked in an oil-based sauce with an immense heat. Interestingly Rogan josh was presented to Kashmir by the Mughals centuries ago and despite its intense red hue, it is normally not a real spicy curry. 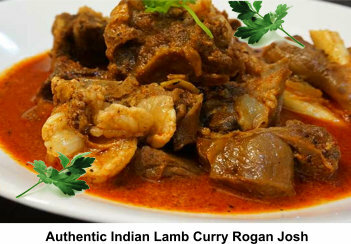 Today Rogan josh still remains a very common dish in the Northern parts of India and is a popular menu item at Indian restaurants in many parts of the world including Australia. Rogan Josh contains goat or lamb meat that is slow-cooked in oil, yogurt and mixed with a larger selection of different spices. The preparation of Rogan Josh, most people start by browning their meat of choice in oil. Once browned the meat is removed from the pan and oil. Then a number of spices are added in stages, garlic, ginger, cardamom, cloves, cinnamon, bay leaves, coriander, red pepper and whole black pepper, are added in to the still very hot oil. Then the meat that was prepared is returned to the pan with plain yogurt. Once the yogurt is added the pan needs to be covered and all the ingredients cooked over a low heat until the meat becomes very tender. There are many types of Rogan Josh variations. As an example, some people add tomato paste or tomato puree to the dish and others include mild red Kashmiri chilies or paprika in the spice mixture. Of course these additions will alter the dish’s taste and intensify its red colour. In most cases Rogan Josh is served with a side of plain basmati rice, or the Indian bread known as naan, many people like to use both rice and Naan. Heat the olive oil in widish, large heavy pot or use a pressure cooker over medium heat. Place the whole spices into the hot oil and let them simmer. Add in the onions and stir-fry for around 5 minutes until they turn medium-brown but donot burn them! Add in the ginger and garlic paste and stir that for about 30 seconds, then add lamb,mutton,goat meat pieces. stire-fry for just over a minute until all is browning nicley. Add in the spice powders and tomatoes to meat masala. then cook all of that for a further 30 seconds or so. Next take the pan off heat and add in the yogurt, continuously stirring so that it does not curdle. Ready for the cooking the curry, cover the pan, turn down the heat to a lower setting and cook until meat is fully cooked this will take about an hour - or pressure-cook until done. The curry should be thick. check it for taste. Balance flavor with lemon juice and sugar as required. Garnish with cilantro leaves, ginger and garam masala. Then serve hot with basmati rice or naan bread or both.